I have several GBs of music (MP3 and Apple iTunes AAC files), lying all around: on my laptop, my Mac, my backup HDs, etc. Yes, I can can carry my collection on my laptop's auxiliary HD - but then I won't have place for another VM when I need to test yet another new OS . So I came up with a solution from the past: a streaming server. You see, back in the days, when I had a 20GB internal HD (and Windows and its cohorts took half of that), I decided to try my hand at streaming. At first I tried using the MS Streaming Server - but that requires running a server version of Windows (2000, 2003) on a computer at home. I tested several Linux based solutions - but finally stopped at Slim Server. 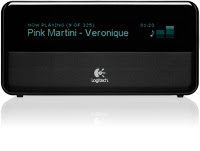 Slim Server is a free streaming server created and supported by Slim Devices - a company that makes and sells devices that can play streamed music, wireless or connected (see image). They were acquired by Logitech - meaning those devices are not going away soon. Back to the server side: although originally intended as a back end for their devices, Slim Server can stream music to any player that can play streamed MP3 (Windows Media Player, WinAmp, Miro etc.). Installing Slim Server is extremely easy. I've installed it on my Mac in literally seconds. It deploys a web application (for Apache on Mac and Linux, IIS on Windows) and is accessible from any device/computer (if your firewall is configured correctly). Slim Server will go through an entire directory structure and index the music files within (may take a few minutes before the server is available the first time, or when you choose to re-index). Another thing you can do, is allow the server to communicate with iTunes directly and gain access to your library. Be aware that locked (DRM) iTunes songs are not available for streaming though, only non-DRM iTunes Plus songs will be available. The server won't stream unless a client is demanding a stream (took me some time to figure that out - and to that greater people than me would say: RTFM). So, start your client, point it to the URL of the server and only then click "Play" in the web interface. Don't forget to configure your firewall (on both the server and the client). You can change the server's port easily. My suggestion: enable the password protection. If you feel brave, download the Perl source code, and tinker with the look-and-feel. Most of us don't have a static IP address. To bypass this problem, try this Tech Tip. Download all versions of Slim Server here.